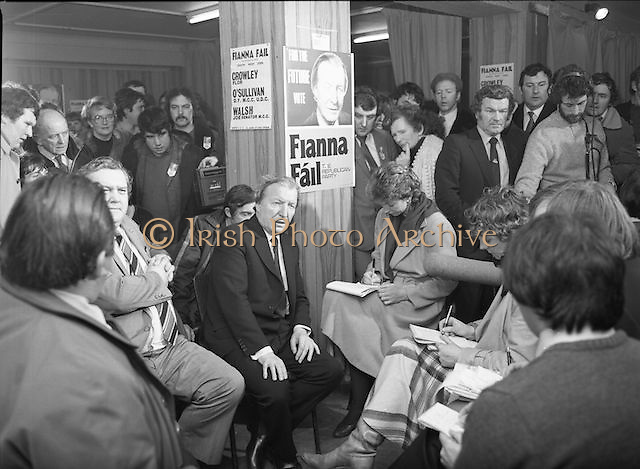 Image of Fianna Fáil leader Charles Haughey touring West Cork during his 1982 election campaign...04/02/1982.02/04/82.4th February 1982..Meeting the press:..Charles Haughey being interviewed by journalists while supporters look on. 1980s 1982 C.J. Haughey Charles J. Haughey Cork city Election campaign Fianna Fáil Irish history Irish politics Republic of Ireland.